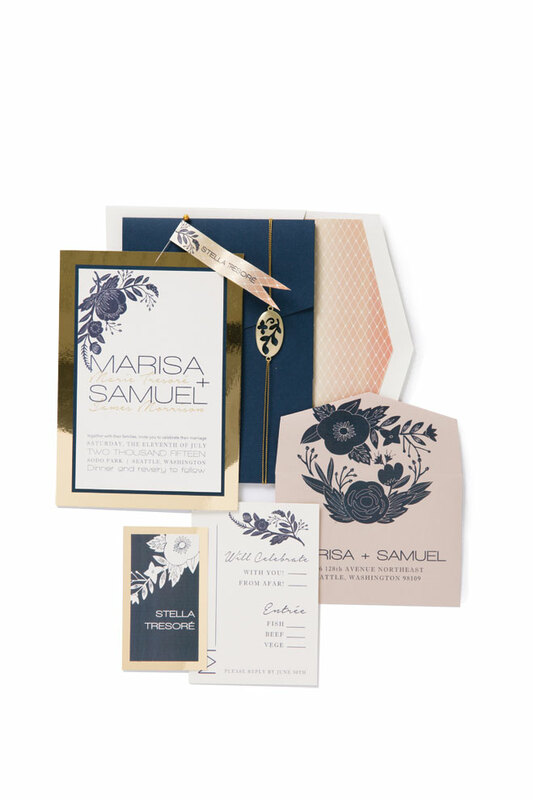 Designed with a mod floral motif and signature monogram, this stunning invitation suite by Paper Moxie’s Sheryl Bracken is edged in luminous gold trim and printed on heavyweight smooth cotton for a luxuriant touch. $15 each, plus an additional $1 each for tented place card, or $2 each for flag style, from Paper Moxie. 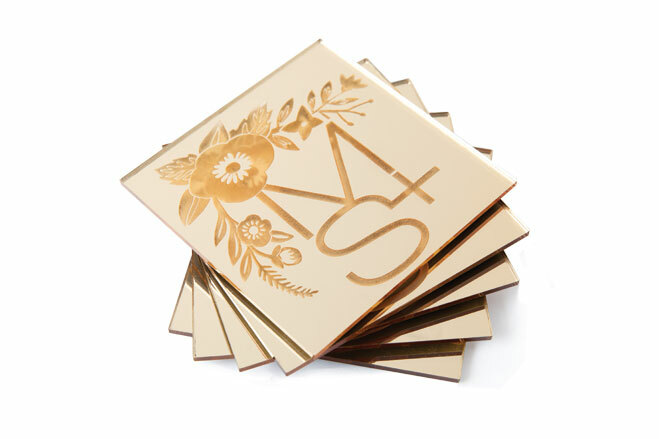 Resplendent in mirrored Lucite, these conversation-worthy square coasters are fit for cocktail hour and beyond, engraved with the couple’s monogram design. $6 each per 100, designed by Snohomish-based Paper Moxie in collaboration with Unique Products. 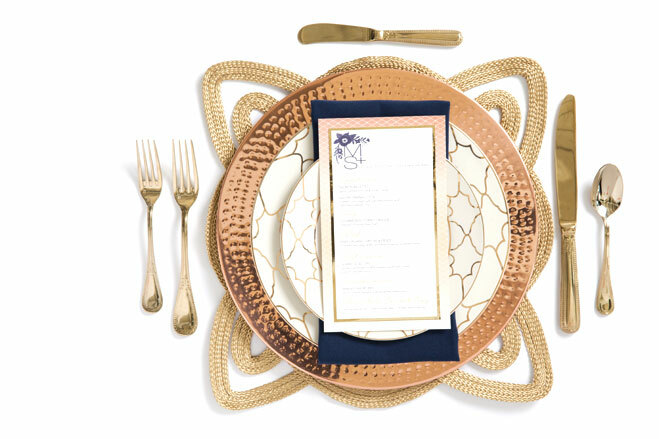 Curated by Wonderstruck Event Design, this expertly layered place setting wows with a geometric woven placemat, hammered copper charger and patterned, gold-accented china from ABC Special Event Rentals. A peach- and gold-trimmed menu completes the ultra glam look. Z Gallerie “Medusa” woven gold braid placemat, $99.80/four from Z Gallerie; Old Dutch Co. hammered rim 13-inch copper charger, $70.59/six from Amazon; “Firenze” china ($.80/piece), “Urban Gold” flatware set ($3.60/set) and navy cloth napkin ($.70 each), all from ABC Special Event Rentals (with showrooms in Mukilteo and Tukwila); custom menu cards, $1.50 each from Paper Moxie. 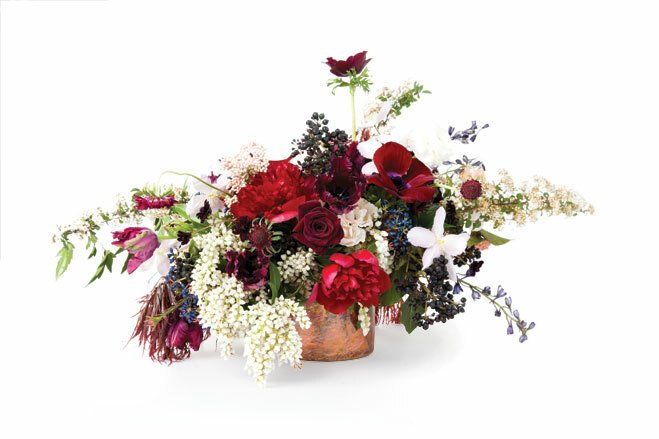 Whimsical and romantic in a copper vase from Wonderstruck Event Design, this garden-inspired arrangement, rich with Black Baccara roses, blush clematis and blue viburnum berries, is pure magic. Bouquet also includes Red Charm peonies, pieris japonica, chocolate agonis, marsala scabiosa, blue delphinium, burgundy anemones, ranunculus, Majolica spray roses, parrot tulips, black ivy berries, ozothamnus, seeded eucalyptus and maple foliage, $385 from Wallingford-based Thatch Floral Flowers by Sara Jane Camacho. 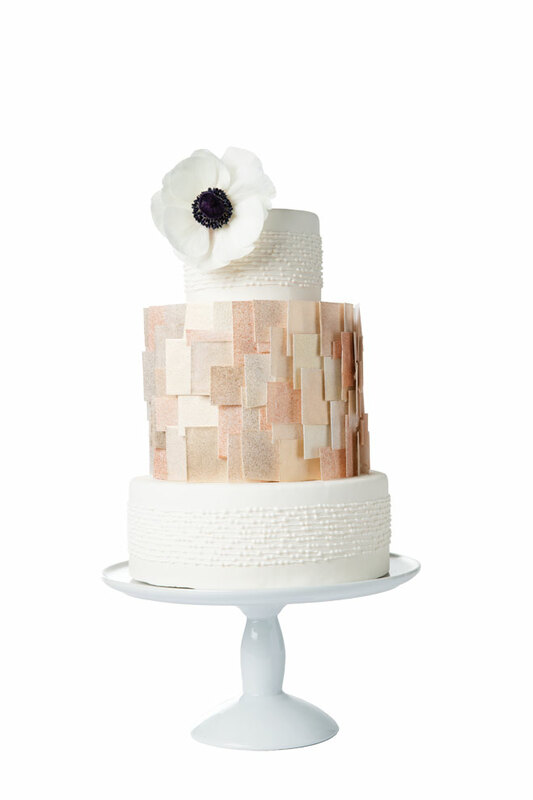 This confection by Bonnie Lyons of New Renaissance Cakes is layered in paper-thin gum paste wafers kissed with edible gold and copper dust for a modern, geometric look. The three-tiered cake is also accented by ivory fondant icing, wraparound bead design and a handmade gum paste floral topper. $10/serving, serves 50, from New Renaissance Cakes on Lower Queen Anne. 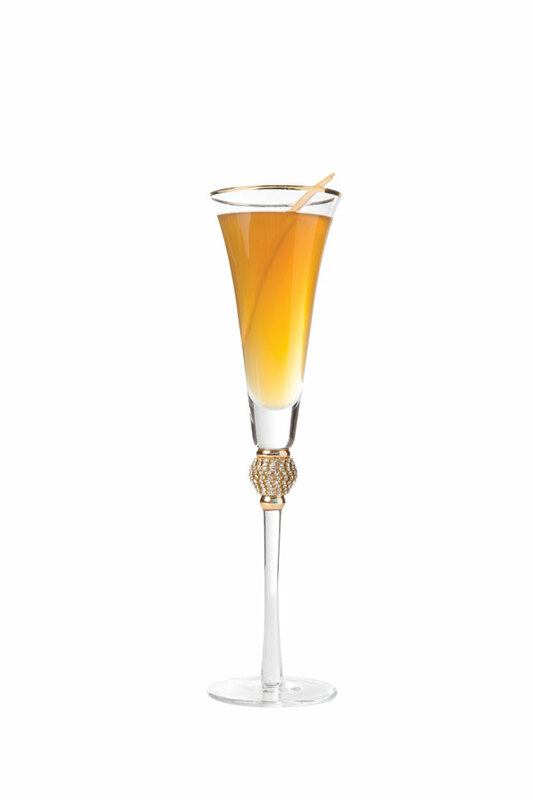 Concocted of splashes of crisp Prosecco and Amaro dell’Erborista Italian bitters plus a citrusy grapefruit twist, and served in an ornamental Champagne flute, this sunny cocktail from South Park’s Gourmondo Catering is one fizzy little sip. $7.95 each from Gourmondo Catering.